So the last comic we have this week is from Vibranium Comics and Games. Unfortunately, this will be the last one this week and then we have a week off so most likely no more comic reviews until after the 20th. We have a huge insane week coming up between doctors appointments for my kid, and a sleep study for me, and then we have relatives on their deathbeds, and so we have some of the inlaws down from Alaska…. But don’t worry, while we won’t be in town to get the comics this week to review for you all, we will still be having some free time and thus we will start working on other things such as game reviews and fan fiction and such. So keep checking back with us as we expand on all things we are doing. After all, if Cancer can’t keep me from seeing through this website then nothing else will either! So remember, even though we are taking a break from the weekly comic reviews, still be sure to give our friendly neighborhood shop some love on their facebook above or their website below…without them, this comic review would not be possible! This weeks last book is a Halo book called Halo: Collateral Damage. This is a book about the Masterchief. It actually shows him with a group of other Spartans on a planet called Alpha Corvi II. This takes place after the fall of Harvest but early enough that the ones sending Master Chief and his group out are asking them to find out information about the Covenant so this takes place early in the timeline though I’m not sure when compared to everything else. This has a good little bit of action an interesting story of Master Chief gaining friends in some rebels that don’t feel like dying to the Covenant. The artwork is alright but not my favorite type. Some of it looks very good, while other parts are more cartoonish, so it’s kind of a jarring style. There’s not much I can talk about that doesn’t give a lot away. If however, you are a fan of all things Halo like I am then you should enjoy this comic. It’s nothing Earth shattering and probably won’t be very relative in the grand scheme of things especially since this is a story from early on in the Halo cycle. It does promise to be a nice entrance to the lore even if not ground breaking or very influential. So what do you guys think about little stories like this? Are they just filler crap or do you enjoy seeing some between the known stories shorts? Should franchises keep doing these little filler stories to keep the fans interested or do we not care unless it is another big and important franchise altering installment? Sound off below as we love to hear what you think! You raise a good question. For me, it’s all about quality. If you take a licensed property and tell a quality story (with excellent art naturally), you’re doing things right. I don’t like filler and I consider anything that’s average or substandard to be filler. For example, Marvel was notorious for putting out books just to take up newsstand space (or now, bookstore and comic book shop space), regardless of quality. If you’re going to sell a comic just to milk its popularity, regardless of quality, it’s filler. 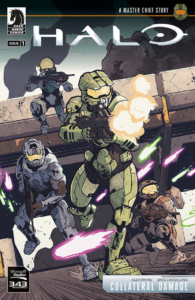 I think some Halo fans would like to learn more about the characters’ backstory so comics can be a helpful way to do so, provided they are good comics.